For most undergraduate students, where you go to college doesn't really matter any more - it's about what you do while you're there. You need to build your network, specialize your skills, and get internships. That's they key to making college worthwhile. So, what if you went to a state college and only had to borrow $20,000 versus going to a more expensive school and borrowing $40,000? How much of a difference would it make on your life? Honestly, it could make a difference of almost $120,000 or more. I don’t think a lot of college students have a grasp of how much say $40,000 in student loans translates into payments once they are out of school. Sometimes it sounds like $40,000 doesn’t sound bad because they say to only take out what you can earn in your first year. But what does that payment look like? And what would it be if you only took out $20,000? In our scenario, we break down what it looks like to take the difference between owing $20,000 and owing $40,000, and putting that difference towards owning a $250,000 condo. Over the 10 year repayment plan, what does that difference look like? How much of a difference does building equity versus paying down debt only make? Our key assumption in that you make the same income regardless of how much student loan debt you make. That allows us to compare the situations. Now here's what $40,000 in student loan debt looks like. You knew it would be more, but did you realize it would be that much more? You can see that the borrower that only has $20,000 and saves money each month actually moves from negative to positive net worth at year five. However, the $40,000 student loan borrower is only at $0 net worth at year 10. Starting at year 10 is where things get interesting. By taking out $20,000 less in student loans, you're actually giving yourself a $37,000 lead on the other person. If we look at just this money - no additions - it will continue to grow at 6% until it reaches almost $119,936.22. So, in 30 years, your "lead" has grow significantly. 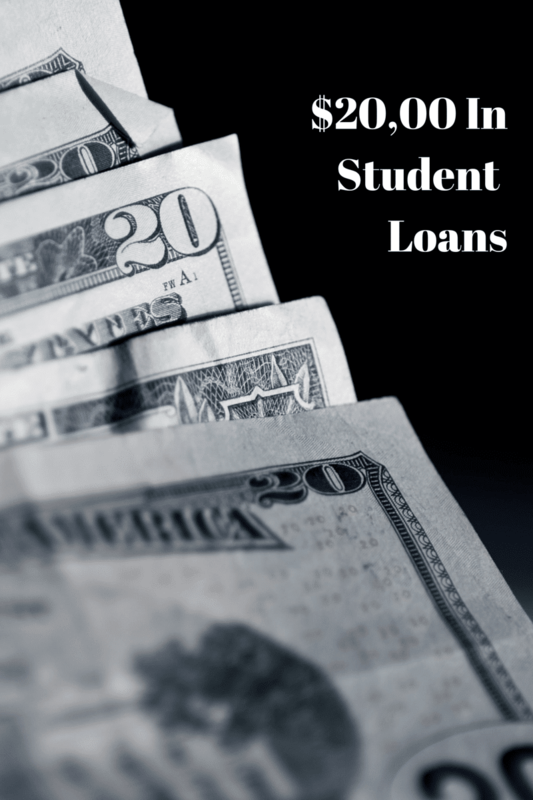 The bottom line is that you should be taking out as little student loan debt as possible. If you can take out $20,000 less when you start school, that money could be worth $120,000 when you get closer to retirement. The amount you borrow obviously has a huge impact on your ability to cross out of debt and into savings but also important is the rate on your student loans loans. In my examples above, I assumed a rate of 6.8%, but if you take out private student loans, the rate and term of your loans can have a big impact. So, shop around to make sure you get the best student loan rate. I recommend using Credible where you can receive and compare private student loan offers from many lenders after filling out one form. I think it really depends on what the $20K difference is buying the student. Are they traveling abroad, going to a better school out of state, etc? If I have an easier time finding a job because of the networking contacts from my alma mater then the degree ends up paying for itself. But if I waste the money ordering pizza and beer nightly, not so much. Certainly cutting college costs are key to getting a head start on your twenties, but there’s definitely a balance to be struck by investing in the market vs. investing in oneself. Very good point about investing in yourself – but you mention traveling abroad. I don’t think that’s an investment – and you should take on student loans to do that. Also, from a networking perspective, that’s a personal choice. You can go to Harvard and not build a network, or your local state school and build a strong network. Cost of college doesn’t equal better or more connected network. I completely agree. I did not have any student loans but my wife had about $30k coming in to when we got married. We paid one off early and now there’s only about $5.5k left and a payment of less than $100 per month with a very low interest rate, but it’s just pesky and I’ve thought so many times about how I would love to just have it GONE! Fascinating article Robert. But compared to a mortgage, a student loan is not that much. I paid off my loan 4 years after I graduated from b-school b/c I was annoyed with it.